Please refer to our stock # T 1823 when inquiring. 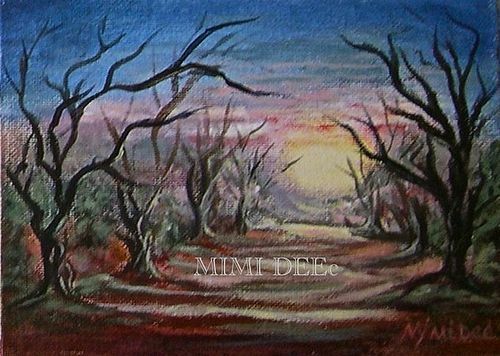 Signed American original landscape acrylic painting depicting a path through a grove of dark oddly shaped trees with exposed roots on either side of a path leading up to a luminous buttery yellow sky in the background. Painted by this self learned painter with a tonalist mood and signed Mimi Dee at lower right.